From its black velvet cover, the scrumptious full color pictures inside and a full read on his life and career, Gillian G. Gaar provides pretty much everything you need to know about Jimi Hendrix, in HENDRIX: The Illustrated History. Published coinciding with what would have been the master guitarist’s 75th birthday, this hard cover is a loving tribute to a man who died too young, but gave rock and roll so much. Truly Gaar doesn’t leave any stone unturned, even rumors and suppositions are mentioned (and there are plenty, certainly nearing Hendrix’s last days) but Gaar makes no claims other than to factual information. And beyond the personal, we get lots about Hendrix’s music, what was recorded when (and where), who played on what, and just exactly what was going on behind the scenes with Hendrix management and the world of rock and roll that made, and might have even broken, this singular talent. The side bar contributions from writers like Harvey Kubernick, Jaan Uhelszki, Dave Hunter and more exploring Hendrix in concert, his gear, his studio work, really round out Gaar’s research. 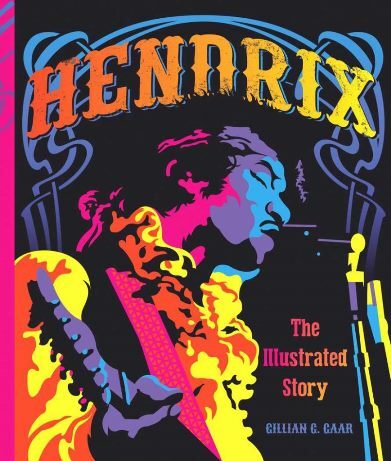 Sporting the word “Illustrated” in its title, this book does feature some amazing photos, a near 200, and this makes HENDRIX: The Illustrated History a true gift book on a subject too many have tackled, but none quite like this.